Help keep your team healthier and show your customers, guests and patients that you care about their well-being with PURELL Advanced Green Certified Hand Sanitizer Gel refills for the LTX Touch-Free Dispenser. PURELL hand sanitizer is the #1 brand most used by hospitals and is proven to kill 99.99 percent of illness causing germs without damaging skin. PURELL hand sanitizer is proven to help prevent the transmission of germs in homes, businesses and healthcare settings. It can even reduce healthcare claims. In a workplace study in partnership with Medical Mutual of Ohio, PURELL hand sanitizer was placed at desks, in common areas and restrooms. Businesses saw a 24% reduction in healthcare claims tied to hand hygiene preventable illnesses. Eight out of ten employees said having PURELL hand sanitizer in the office positively impacted the impression of their employer. PURELL hand sanitizer is formulated to be gentle on skin with four conditioners and is clinically proven to maintain skin health. It is free of harsh preservatives, and does not contain dye, triclosan, parabens or phthalates. This Ecologo Certified and USDA Certified Biobased formula is made with naturally renewable alcohol, with 93% Biobased content. The PURELL Advanced Hand Sanitizer refill works with the LTX Touch-Free Dispenser to help prevent the transmission of germs. LTX is a leading dispenser system, with millions of units installed across offices, healthcare facilities, stores, colleges and other businesses. Across billions of uses LTX dispensers and refills are proven durable and dependable. 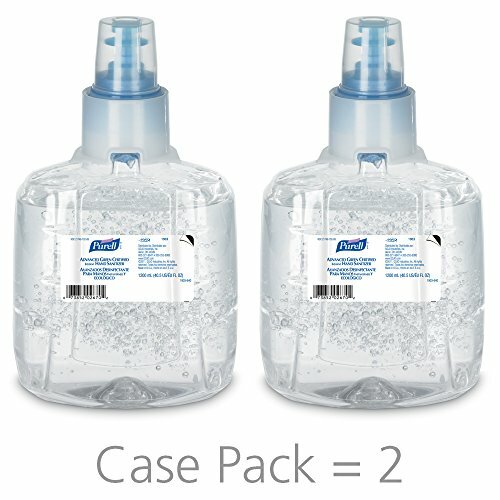 Case pack includes: 4- 1200 mL PURELL Advanced Green Certified Hand Sanitizer Gel refills. Each 1200 mL refill holds 1090 uses. Dispenser sold separately.